FSG has been actively involved on development of industry Earthworks specifications such as MRTS04 for Queensland Main Roads. Dr Burt Look has developed and presented the Engineering Education Australia (EEA) two-day Earthworks course since 2006 which over 1,000 engineering professionals have attended nationally. He has also developed and presents an associated 1-day course on “Earth Structures” for EEA. FSG works with the Australian Road Research Board (ARRB) and Queensland Main Roads for research directed towards best practice in compaction quality assurance. Working platforms are critical for the safe operation of heavy construction equipment such as piling rigs and cranes. The specific design of a working platform varies greatly, depending on a number of factors including the underlying geotechnical conditions, loading requirements, type of construction activity and the material used within the working platform. FSG have undertaken design for working platforms in various locations across Australia and on a wide variety of technically challenging projects. In addition, an assessment procedure has been established by FSG to evaluate the safety of the constructed working platforms for construction job sites. Our specialist field testing equipment (LFWD and PANDA) allows us to optimise our designs and makes FSG an industry leader in temporary works design and verification. These specialist tests may also be used in conjunction with more traditional techniques such as vane shear and DCP measurements. FSG utilises the most efficient procedures based on research and industry requirements for compaction control. Dr Burt Look has developed procedures to determine equilibrium moisture conditions with control measures such as upper characteristic values for compaction control and zoned embankments and the use of weighted plasticity index as a screening tool. These procedures have been adopted by various Road Authority specifications. FSG has also pioneered various in-situ and direct testing techniques, which provide faster turnaround than traditional density control. The earthworks processes involved in the design and construction of buried pipes are often poorly understood. Buried pipes are horizontal earth structures. They must provide a passage for the fluid for which they are designed and equally importantly, they must be correctly installed and be designed to support the weight of the ground and any load on it. Unless the pipe is properly installed, it can cause serious problems not only to itself but to pavements, buildings, other structures, and equipment. The characteristics of rigid and flexible pipes and its soil structure interaction are different within a trench or embankment, and for various methods of installation. The designer and construction requires an understanding of the effect of the various layers within the pipe embedment zone. FSG has been involved in several expert witness roles for buried pipe projects and written a number of project specifications and papers on this topic. FSG has the relevant expertise and experience to confidently design and specify the geotechnical aspects of the construction process. FSG provides practically approved innovative methods to design and assess subgrade characteristics. 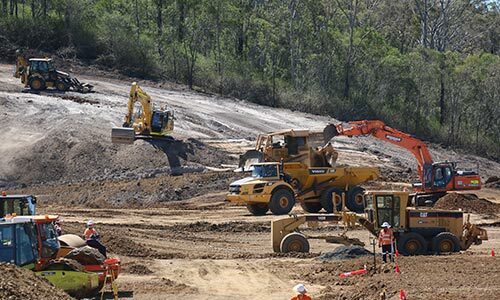 Dr. Burt Look and Dr David Lacey have introduced innovative testing methods to Queensland such as Light falling weight Deflectometer (LFWD) for subgrade assessment and quality control to many Queensland projects. David’s PhD thesis is based around the use of LFWD technology in residual soils and he has published several papers on LFWD technology. The LFWD is a surface based, dynamic plate load test that provides fast and direct measurement of a composite insitu modulus parameter of the near-surface. The direct measurement of modulus by the LFWD negates the need to indirectly estimate the parameter using Dynamic Cone Penetrometers (DCPs) or density testing, both of which have transformation errors associated when “universal” correlations are applied. Due to these advantages the employment of the LFWD is increasing throughout the construction industry for quality control work. Technical specifications provide guidance on quality levels and documents the procedures to be followed to achieve an acceptable standard. Each road specification represents the accumulation of local experiences and issues that are unique to that environment. While it is a worthy ideal to “Standardise” across Australia, there are significant differences that occurs for various Road Authorities across each region due to Australia’s wide climate variation, geology and land area. “Standard” earthworks specifications, balance the dichotomy of recognising the complexity of the situation and yet providing simplicity in a procedural approach. The specificity and complexity of a project must be recognised, and yet reduced to a simple standardised procedure. FSG has been involved in developing project specific specifications for buried pipes and earthworks control on numerous projects. These included a modulus based quality control procedure for deep lift compaction. Equivalent lower characteristic values were developed similar to traditional density operating characteristic quality controls. FSG has also developed methodology specifications, where traditional testing cannot be applied for some materials. Large earthworks project requires specific considerations that Standard specifications may not always recognise. Current specifications typically use a lift thickness to provide confidence that a minimum allowable relative compaction level has been achieved, and this corresponds to the stress envelope for light to medium compaction equipment. Larger, or vibratory equipment has a larger zone of influence, and can therefore compact to a deeper level and still achieve similar compaction results. FSG has developed specifications which recognise these differences in modern compaction equipment. This included dynamic monitoring to show the equivalent force from vibratory rollers. As these rollers derive much of their compactive force from the amplitude of vibration, their compactive force can be significantly above their static weight. Changes in the moisture content of volumetrically active (expansive) clays result in movement of overlying pavements and changes in the subgrade strength. This adverse effect results in damage to roads and structures. With over one-third of Australia covered with such clays, the design of structures affected by expansive clays is an important engineering consideration. The assessment and design of infrastructure on expansive soils is an area of specialist expertise. Innovative design procedures such as Vertical moisture barriers and zonal strategies for expansive clay moisture control were introduced to Queensland roads in the 1990s by Dr Burt Look. His PhD research was on “The Effect of Volumetrically Active Clay Embankments on Roadway Performance”. The understanding and development of concepts currently adopted in various Main Roads earthworks specifications flowed from these findings. In-situ rock weathering results in residual soil, which account for over 80% of the soils in Australia. The mechanics of residual soils are different from that of transported soil. Soil mechanics developed from observations and testing in mainly transported soils are not necessarily applicable to residual soils. Due to the in-situ formation, residual soils are generally heterogeneous and progressively grade to the characteristics of their parent rock. In comparison, alluvial soils have been sorted during transportation and are likely to be more uniform in composition with distinct layers. Reactive (expansive) clays may be derived from these residuals soils. 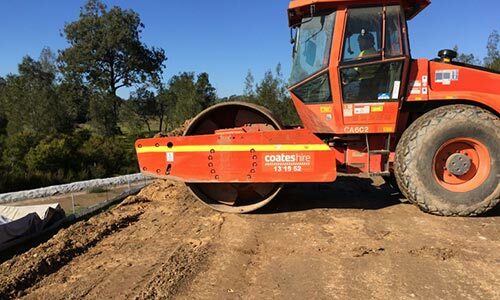 The economics of using available local material provides a significant cost saving during earthwork construction, where cut and fill is required. These differences need to be understood during geotechnical testing, design and construction. For example, soil suction, rainfall induced slope stability, and shallow slope failures are more relevant in residual soils compared to transported soils. Dr David Lacey completed his PHD research in this area on “The Assessment of engineering properties and testing methods of residual soil and highly weathered rock materials in Queensland, Australia”. These local Australian experiences of construction in residual soils places FSG in a unique position of providing technical expertise for this dominant soil type in Australia.